For people who already have their hands full keeping up with Facebook, scanning Twitter tweets, and answering email too, here’s a heads-up. The cool kids and big egos of Silicon Valley are busy colonizing a new social network—and soon you may want to as well. It’s called Quora, and the basic idea is that you can post questions and others will answer them. What makes Quora noteworthy is the surge of boldfaced names holding court there: tech mogul turned sports mogul Mark Cuban; Steve Case, the founder of AOL; and Netscape founder Marc Andreessen, to name a few. You’ll find noted Twitter addict and actor Ashton Kutcher there too. Until recently Quora was used mostly by Valley insiders. A lot of the questions have to do with tech startups, like, “How will Bnter monetize?” and “How did Jack Dorsey, Ev Williams and Biz Stone split up the equity on Twitter when they restructured Twitter (post-Odeo)?” (Go look up the answer if you really need to know.) Josh McFarland, CEO of a venture-backed Internet startup called TellApart, says he visits Quora every day to keep up on topics like machine learning. He says it’s also a great recruiting tool. “You can very quickly get a sense of who is interested in a topic, and whether they get it or not,” McFarland says. But as Quora grows, questions are veering into the mainstream. “What’s the best hotel in Madrid?” “Where can I look for the cheapest airline tickets?” Companies and marketers may need to join the conversation whether they want to or not, just as they’ve been drawn into Twitter and Facebook already. 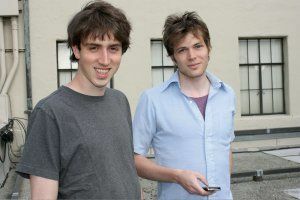 The site comes from two talented young former Facebook engineers: Adam D’Angelo, Facebook’s onetime chief technology officer, and Charlie Cheever. They started the company in June 2009 and last year raised $11 million in funding, effectively valuing the company at $86 million—pretty staggering for a company that was barely more than two guys and an idea. It’s too soon to tell if Quora will go big time. Right now, it draws fewer than 200,000 monthly unique visitors, according to Comscore, a market researcher. That’s tiny compared with Twitter and Facebook, which draw 24 million and 154 million monthly visitors, respectively. But to some, it feels awfully familiar—like Facebook in 2006, or Twitter in 2007. Regardless, some users find it incredibly addictive—and some moguls, too. Marc Bodnick has been a key player at Elevation Partners, the private-equity firm launched by U2’s Bono and Valley legend Roger McNamee. Now Bodnick is jumping ship at Elevation to become a Quora executive. His claim to fame? We can answer that one: he was one of the first to spot the potential of Facebook.